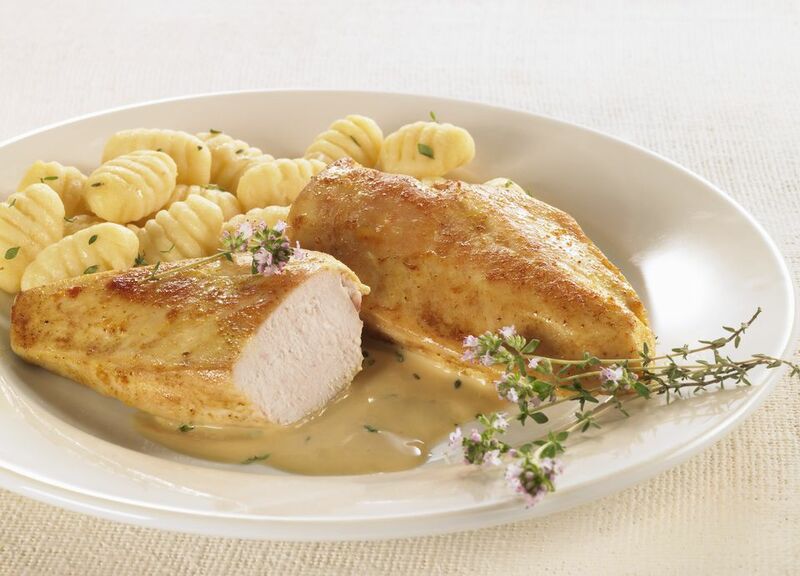 Honey, thyme, and pine nuts make chicken breasts shine in this dish. The breasts are browned in a heavy skillet and finished in the oven for a moist and flavorful result. Take care not to overcook the chicken or it will become dry and chewy. Recipe reprinted with permission from Come for Dinner by Leslie Revsin (John Wiley & Sons). Preheat the oven to 400 degrees with the rack in the center and a heavy roasting pan large enough to hold all the chicken pieces with plenty of room around each piece. Mix the honey, 3-1/2 tablespoons of the olive oil, the lemon juice, Worcestershire sauce, thyme, oregano, and mace in a medium bowl until smoothly combined. Stir in the pine nuts, season with salt and pepper, to taste. Dry the chicken breasts with paper towels and season them generously with salt and pepper. Set a large, heavy skillet over medium-high heat with the remaining 1 tablespoon olive oil. When it's hot, brown the breasts in batches, skin side down, adding more oil if needed, until they are golden and the fat from the skin is rendered, 3 to 5 minutes per batch. When all the breasts are browned, transfer them to the roasting pan, skin side up, and coat each with the honey mixture, spreading it with the back of a spoon (some will drip in the pan). Pour the vermouth around the breasts and place the pan in the oven. Roast until the chicken is just cooked through, 15 to 18 minutes (to check, make a cut in the thickest part of one breast to see if it's white in the center). If at any time the juices threaten to evaporate and burn, add a little more wine or water. Transfer the chicken to a warm platter or plates and reserve the roasting pan. Set the pan directly over low heat (or transfer the juices to a small saucepan) and cook the juices down with any accumulated platter juices, stirring, until it becomes a flavorful, light syrup. Season with more salt and pepper if you like, spoon the juices over the breasts, and serve hot.